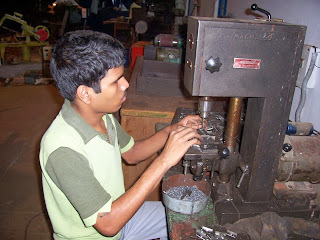 The Centre offers vocational training in a wide range of industrial and other occupations to visually impaired adults. The training also include orientation and mobility, communication skills etc. MASSAGE TRAINING (6 Month): The training for visually challenged adults has been designed in collaboration with the famous VLCC Institute covers Swedish, Thai, Aroma and Head Massage. For imparting further training to the past trainees a part-time course in Ayurvedic Massage is being conducted under the care and support of Shehnaz Husain International Beauty Institute. In addition, visiting experts impart skills in alternative pain-management. These skills have opened up new avenues for the visually challenged for jobs and self-employment. 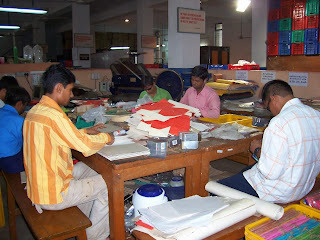 MULTI-SKILL TRAINING (1 Year): An innovative 1-year training programme designed for adult blind (male/female) between the age of 18 to 35 year who have either missed-out school education or are marginally educated to acquire a variety of skills to become useful workers for industry or become self-employed. Skills covered are book binding and paper craft, basic massage, chair caning, sewing, candle making, packaging, soap making etc. The trainees also have supportive sessions on personality development, understanding computer, Braille, music, orientation and mobility. CANDLE MAKING: The programme provides training and remunerative work to the visually impaired. Also, representatives/persons deputed by NGOs/welfare organizations are welcome to undergo training to start such programmes in their centers. Wide range of candles produced at BRA have great demand, particularly during Diwali season. CALL CENTRE TRAINING: Designed for computer literate visually challenged adult blind, an upgraded call centre training is being given since 2014. Training includes soft-skills, knowledge and practical experience of working on auto-dialling CRM process for telemarketing at par with mainstream call centres so that they could compete in the mainstream job market. Under 6-month training programme the trainees receive stipend and incentive as they master the skills of telemarketing.